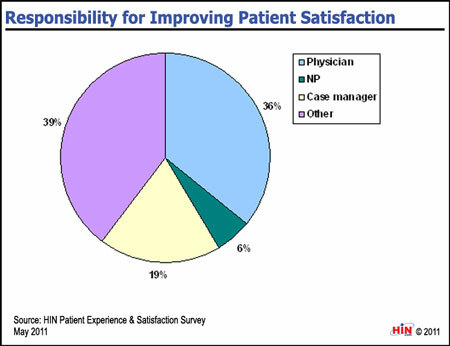 Healthcare Intelligence Network- Chart of the Week: Who's Responsible for Improving Patient Satisfaction? New Chart: Who's Responsible for Improving Patient Satisfaction? SUMMARY: Patient satisfaction with the healthcare experience is influencing quality ratings and value-based reimbursement levels. We wanted to see who has primary responsibility for efforts to improve patient satisfaction. Download the executive summary of 2011 Benchmarks in Patient Satisfaction Strategies: Improving the Healthcare Consumer Experience. 2011 Benchmarks in Patient Satisfaction Strategies: Improving the Healthcare Consumer Experience presents new market research on industry efforts to enhance the patient experience and levels of satisfaction with their care. This 35-page analysis, based on the responses of 146 organizations to the Healthcare Intelligence Network May 2011 survey on Improving Patient Satisfaction and the Patient Experience, presents the all-new data in more than 45 easy-to-follow graphs and tables. 2011 Benchmarks in Patient Satisfaction Strategies: Improving the Healthcare Consumer Experience is available from the Healthcare Intelligence Network for $127 by visiting our Online Bookstore or by calling toll-free (888) 446-3530.